Every time you pick up a pencil, concentrate on creating the best lines you can. Studies show it increases your awareness. Most graphically oriented people that I’ve met, especially architects, have had interesting and intriguing handwriting. One cannot fail to recognize it immediately. The first impression that comes to mind is a feeling that the person is intelligent. Yes, it’s ‘old fashioned.’ Yes, it’s thought of as passe in this day of so much keyboard entry. 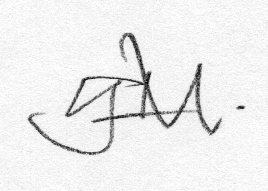 But if you want to get the impression across quickly that you know what you are doing and why, show someone your excellent handwriting. It’s an ancient art and it’s still in vogue. No, it's not quaint. Forget the Palmer Method that you were raised with. I would suggest studying Chancery Cursive as it has shown that it is a far more steady, legible, fast, and beautiful pen-hand and has been around for centuries. Develop a block-hand (printing) style as well. There is much research out now on hand, eye, and mind coordination, especially for teaching children. A basic understanding of neuroscience shows that the application of drawing skills through the direct connection of feeling a line form under a pencil makes new and specific nerve connections in the brain, enhancing pattern recognition. It not only increases motor skills, but increases mental activity throughout the cerebral cortex. Simply put, drawing isn’t just on the right side of the brain. It stimulates multiple areas of thought and makes connections between emotions, memory, logic, and visual aspects. MRI scans have shown multiple areas of the brain firing simultaneously. In other words, handwriting makes one smarter. It also indicates character, and thereby breaks down social barriers. Handwriting impresses and calls attention to the writer. Just like drawing skills. Develop a legible, fast, handwriting style. Make it your own. Practice by writing notes about your many painting ideas. Make lists. Every time the pencil hits the paper, try to make it the best you’ve ever done. When you do that, your learning speed increases. If you're embarrassed by your handwriting, make the time to develop it. Look around you and study the people you know who have good handwriting. The ones who tell you it’s not important...usually have lousy handwriting. If they don’t care, we won’t either. You’ll notice it in their drawing skills, too. For more on this, start with this article in the Wall Street Journal. You can google more from there.